While inconvenient and sometimes a little painful, canker sores are more annoying than they are concerning. 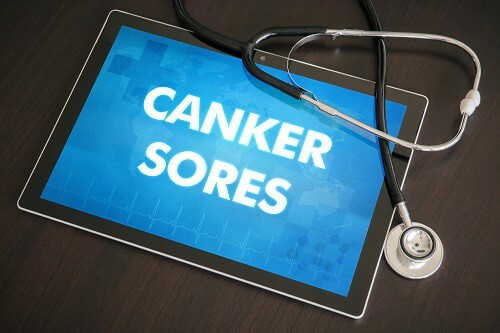 But when canker sores pop up you may wonder what these ulcer-type spots actually are, what caused them in the first place, and how to treat them quickly and effectively. At our Auburn dental office, we’re here to answer some of the most common questions about canker sores and provide you with some tips on how you can get some relief. Canker sores are small sores that occur inside the mouth. They typically resemble a blister and are red, bumpy circles. Sometimes a canker sore can appear white or almost gray in color, too. Although canker sores can sometimes be confused with cold sores, the main differences are that cold sores usually affect the outside of the lips or mouth and are contagious while canker sores are not. If you can correlate a canker sore to something you ate, try to avoid that food or eat it in moderation. How Do You Treat Canker Sores? There is no cure for canker sores, only treatments to help alleviate discomfort while they run their course. Canker sores usually resolve on their own in a week or two. In the meantime, the most common treatment is using an over-the-counter numbing agent. Some dentists may also use a laser to help reduce the healing time. Canker sores happen to all of us, but they’re typically nothing to worry about. However, if you notice sores that multiply or don’t see relief in more than three weeks, call your Auburn dentist to schedule an appointment. Of course, our dental office in Auburn is always here to help with any other issues you might be having. We happily welcome new patients and would love to see you. Call to schedule an appointment today.